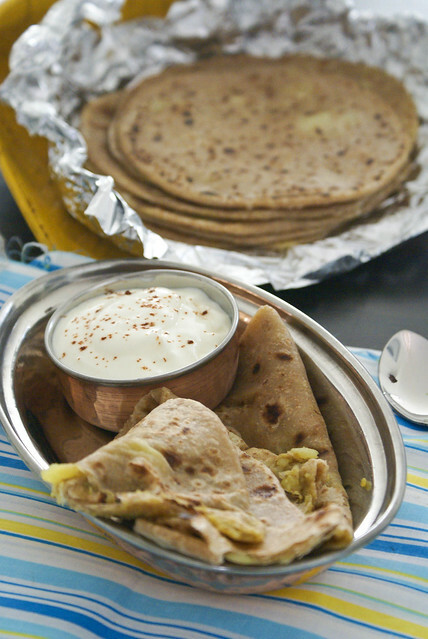 Paratha – I guess it needs no introduction. This is one such dish that can be served for breakfast, lunch or even dinner. The best parathas in India are served at the road side dhabas. Sitting on a wired cot and enjoying parathas served with pickle and curds, along with a big glass of lassi… is just an amazing experience!! The first name that comes into mind when we say paratha, is the aloo paratha. It is the basic and the most delicious paratha of them all. I wonder how I missed posting that all this time. I still need to master the art of getting the perfect round shaped parathas 🙂 But these were near to perfect! Cook potatoes in a pressure cooker, its easy and fast. While the potatoes are cooking, prepare the dough. Add salt to wheat flour. Add water little at a time until you get a soft pliable dough. At the end add the oil and knead to get a non sticky dough. Knead well. It should make a soft dent when you press your thumb down. After the potatoes have cooked, drain water, cool completely and mash them without leaving any lumps. Add in all ingredients under Filling, and mix well. Make small lemon sized potato balls and keep aside. Take dough and knead again for about minute and make big lime sized balls. 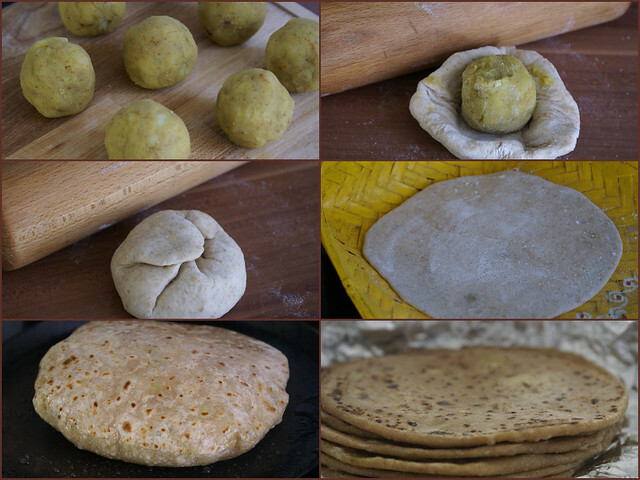 Dust it with wheat flour and roll it into thick disc. Place the Potato balls in center. Cover and seal the ends and roll again, dusting flour if necessary, into half a centimeter thick roties using rolling pin. If the mixture is oozing out when you roll them, then you can make them the other way. Make two portions of the big lime sized dough ball. Roll them into flat discs. 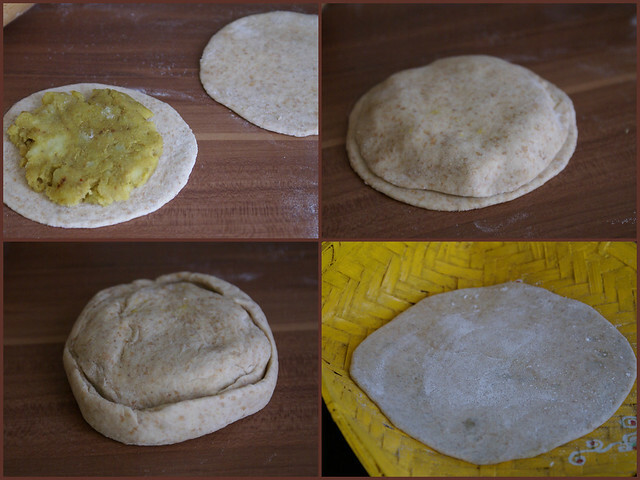 Spread the mixture on one disc and cover with an other, seal the edges, and roll them out a little, dusting with flour. Heat an iron griddle and cook the parathas with generous dabs of butter on both sides, till small brown dots start to appear. The filling need not be exactly the same as above, it can be flexible and you can add anything according to your taste, like minced onions, garlic, more spices, etc. But it tastes better if it is mild and simple. Parathas can also be stored. Make paraths, cool and stackup them up on top of each other with a wax paper in between. Wrap them in an aluminium foil and put in the freezer. They can be de-frosted and re-heated before serving. 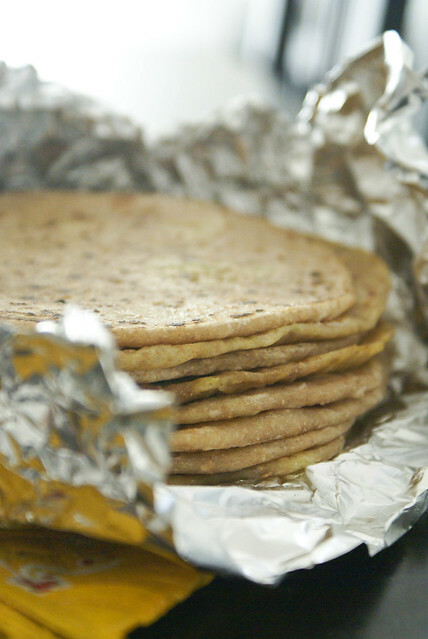 To re-heat, place the paratha on a hot gridle or tawa and cook until it become crisp on both sides.